Kim Koivu claimed his third European Challenge Tour victory of the season by six shots at the Rolex Trophy, securing himself European Tour status in the process. The Finn carded a final day five under par round of 67, adding to his previous rounds of 62-65-72 to claim the historic title at Golf Club de Genève and complete a remarkable eight months since he turned professional in December 2017. Koivu, who won in China at the start of the year and Finland earlier this month, quickly moved away from overnight co-leader Marcel Schneider as he carded five birdies in his first six holes. The German could not keep up with Koivu as he dropped shots, while the 27 year old made another gain on the ninth to move six shots ahead at the turn. A bogey on the 11th did not rock Koivu’s rhythm as he bounced back with a birdie on 14. Even a final dropped shot on the 17th could not wipe the smile from the Finn’s face as he sealed victory and his European Tour card with a two-putt par on the last. 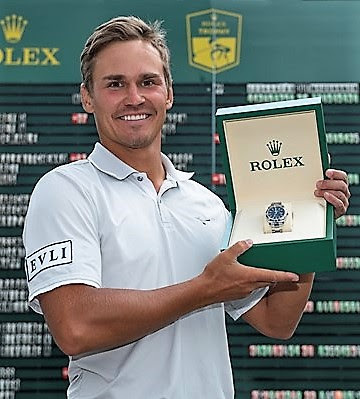 “It sounds awesome to be the Rolex Trophy champion. It’s what I came here to do, and I’ve done it, so I’m very, very happy,” he said. “I don’t know if I’m going to continue playing on the Challenge Tour or play European Tour events. It’s up to my team and I to decide, so we’ll see, but I don’t know yet. “This was probably the most emotional win. I felt very tired over the last couple of days because this is my fifth week in a row and I’ve been in contention at a few of them. “A lot of things went through my head on the front nine, but I put those thoughts aside, and I’m very, very happy at the moment. I can’t put into words what this means. Schneider claimed the runner-up spot after his one over par round of 73, while Grant Forrest shot a bogey-free round of 66, six under par, to leap up the leaderboard and claim third one shot ahead of Minkyu Kim and Simon Forsström. Joel Girrbach was the closest Swiss challenger and finished in a share of sixth on 13 under par with Daan Huizing. Winner Koivu earned 30,150 euros; Grant Forrest earned 15,150 euros for rounds of 71, 70, 66 and 66 - 273. David Law finished 24th with four steady rounds of 70, 69, 71 and 71. The Aberdonian earned 3,080 euros.